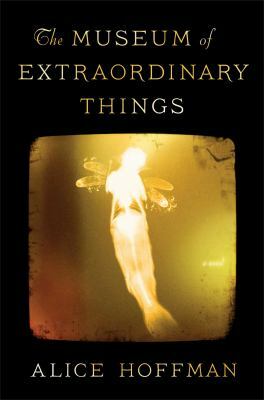 Not quite urban fantasy, Magical Realism mixes details of magic into otherwise ordinary everyday life where you are never quite sure when a character cries a river if they are just being metaphorical or that truly something supernatural has occurred. Magical Realism is most often associated with Latino authors such as Laura Esquivel and Gabriel Garcia Marquez, but several US authors have also embraced the genre. Two of my favorite authors who write magical realism are Alice Hoffman and Sarah Addison Allen. Both authors rely heavily on place in their work. Hoffman frequently sets her novels in New England where she lives with her husband or New York where she grew up, while Allen’s work highlights the atmosphere of the South. I love the beautiful modern adult fairy tale quality many of their works have. Both have strong female characters perfect for a read during Women’s History Month in March. Notably both authors are strong women themselves. Allen was diagnosed with breast cancer in 2011 and acknowledged all those who helped her get through her battle at the end of her latest novel. Alice Hoffman herself is a fifteen year breast cancer survivor and frequently does charity efforts to raise awareness about the disease. 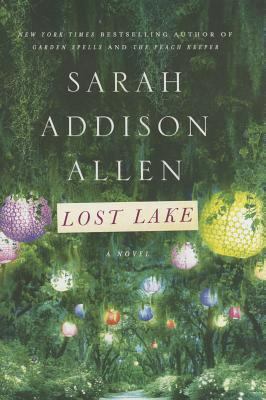 Fans of Sarah Addison Allen were recently delivered an early Valentine’s gift in her latest novel Lost Lake. Kate has just woken from a year of sleepwalking through life after the death of her husband. She decides on the day she is scheduled to move in with her mother-in-law to take her daughter, Devin, on a spontaneous road trip to visit her Great Aunt Eby, who owns a set of vacation cabins in Lost Lake, Georgia. The charming visitors and inhabitants of Lost Lake includes Eby’s Parisian best friend Lisette, Kate’s former childhood love Wes, heartbreaker Selma, the quiet Jack, and a mysterious alligator that has a secret to share. Although some of the situations border on the cliché, the sweet depictions of the characters and the beautiful setting will have you moving quickly through the novel and wishing there were another hundred pages to savor like Lisette’s delicious French pastries. Her other novels include Garden Spells, The Sugar Queen, The Girl Who Chased the Moon, and The Peach Keeper (which was a selection for the Library’s book discussion in 2012). I especially enjoyed The Girl Who Chased the Moon, which depicts Emily Benedict’s move to her grandfather’s house where she hopes to learn more about her mother, Dulcie, who is remembered by the townspeople as being anything but sweet. To me this is the most original and captivating of her works. Be sure to check out Allen’s website for updates on what she is working on, recipes to go with the books (Allen is a foodie), and other fun extras like a virtual tour of the town from The Girl Who Chased the Moon. Those who enjoyed Alice Hoffman’s most popular novel Practical Magic, should also enjoy Allen’s debut novel Garden Spells; both stories contain a set of sisters who learn to reconnect with each other and embrace their special talents. Some of you may remember the 1998 film version of Practical Magic starring Sandra Bullock and Nicole Kidman, but the film only hints at the enchanting writing of Alice Hoffman. Her 1997 Bestseller Here on Earth was a selection of Oprah’s Book Club. As in the case with some of Allen’s books it features a woman who must return to the town where she grew up, which motivates dramatic changes in her life. We discussed 2009’s darkly haunting The Story Sisters for one of our library book discussions. Besides her adult novels Hoffman has written several books for teens including Aquamarine, which was made into a film in 2006, and even a few children’s books. You can learn more about her books at her website. Hoffman’s latest novel, The Museum of Extraordinary Things, takes the reader back to 1911 New York. Coralie Sardie is raised by her father in isolation and forced to perform as a living mermaid (she was born with webbing in between her fingers). Her father owns the Museum of Extraordinary Things, a Coney Island Freak Show, which also exhibits a variety of other oddities. Eddie Cohen is a Jewish Russian refugee who has become a photographer but still feels resentment towards his early poverty and empathy towards the suffering of those he captures in his photos. Imagery of water and fire play heavily in the novel, which has slightly less magical elements as compared with some of her previous works. It is a much denser and darker novel than Lost Lake. I enjoyed the mix of first and third person perspective and the interweaving stories of the two protagonists set against the historical backdrop. Magazines have always been my favorite media to consume. 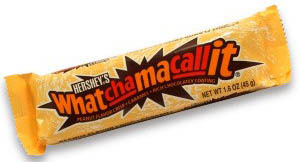 When I was a kid my grandma would give me $5 to go to the Quik Check up the street from her house, which I used to buy magazines like Bop or 16 or YM, and a Whatchamacallit candy bar. Back in college I interned at Seventeen magazine, a cool experience that was not at all similar to The Devil Wears Prada. Today I still like to buy and collect magazines. Over the years I’ve purchased and subscribed to many magazines (mostly fashion, entertainment, and travel titles) to the point that they would accumulate because I didn’t have time to read them all. 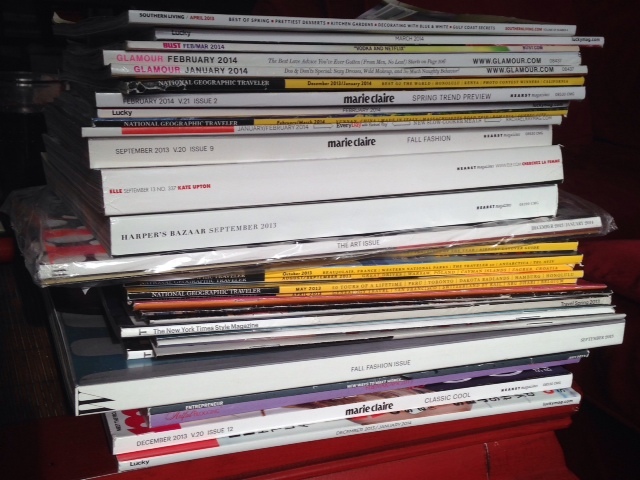 It was not uncommon to see stacks of magazines on my coffee table at home. The Hoboken Public Library has over 120 titles in its magazine collection, and I can (and do) borrow as many magazines as I wish. This has helped significantly cut down on the coffee table clutter. But now the library offers Zinio, an online service that offers full color digital magazines to borrow using your library card. Zinio has over 130 titles in its collection. The easiest way to access Zinio is from the banner on the Hoboken Public Library’s homepage. To start borrowing magazines, you’ll need to enter your library card number and then create an account on Zinio. You can search for magazines by title, or browse by categories. Magazines borrowed from Zinio can be viewed on your computer or tablet and on your smartphone. I usually access Zinio through the Zinio app on my iPhone. (An Android version of the app is also available.) What I like best about Zinio is that there is no due date to return magazines–you can keep them for as long as you like. 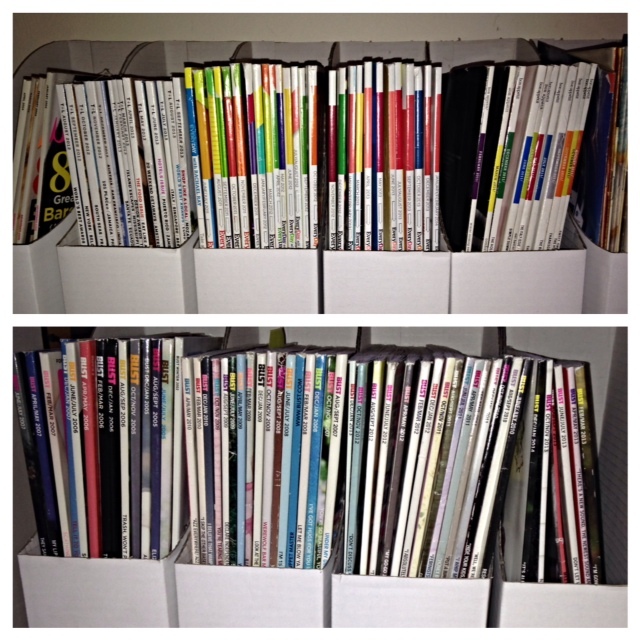 This appeals to my magazine-hoarder tendencies. See this link for more information on accessing Zinio. Contact the Reference Department at (201) 420-2347 or at hobkref@bccls.org if you have any additional questions.